Suffolk County Crime Stoppers, Suffolk County Police, and Southampton Town Police detectives are seeking the public’s help to identify and locate the woman who robbed a bank in Hampton Bays. Hampton Bays, NY - July 7th, 2015 - Suffolk County Crime Stoppers, Suffolk County Police, and Southampton Town Police detectives are seeking the public’s help to identify and locate the woman who robbed a bank in Hampton Bays. A woman entered the Chase Bank, located at 47 West Montauk Highway, approached a teller at approximately 3:30 p.m. and presented a note demanding cash. The teller complied and the woman fled on foot. The suspect was described as black, between 30 and 40-years old, approximately 5 feet tall with a stocky build. She was wearing a blue-colored baseball hat, blue t-shirt, and sunglasses. 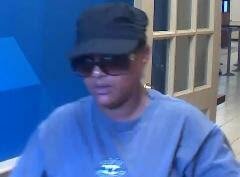 Subject: LongIsland.com - Your Name sent you Article details of "Woman Wanted for Robbing Hampton Bays Chase Bank"